This past Sunday, we talked about how the heart of resurrection is change. Change from one state to another, from death and despair to life and hope. That is the very essence of resurrection…a change that takes place in someone, something or someplace that restores him, her or it to life…and not just any old life, but to new and abundant life. I mentioned that change can be hard…uncomfortable. But that discomfort and unrest is exactly where God meets us and finds us. Change is where we experience the new life that God has for us. You may recall that I said the discomfort of change is not meant to make life unsustainable and disorienting. In fact, in the midst of the discomfort of change, there are core aspects of our faith that are changeless. And I alluded to some of those, including for example, our scriptures, our core practices like communion and prayer. The way that we do these things may need to change, but the fact that we do them does not change…it remains. And the changeless-ness of doing these core practices is something in which we can take great comfort and assurance. And this keeps us grounded and secure and helps us manage the discomfort that accommodate with changing the packaging of our messages and practices. Today, I want to talk a little more about some of these changeless core practices. I want us to get Back to Basics of our faith. And when I say Basics, I mean the basics of Christian faith, but also the basics of we Disciples of Christ as a fellowship of Christ followers. Joanie and I are taking a disciples history class right now as a part of our process in becoming recognized ministers within the Christian Church, Disciples of Christ of which our church is a part. While much of this history I have already read about and studied, it is offering good reminders. The Christian Church, Disciples of Christ, was founded upon the joining together of two movements : one under the leadership of Barton Stone and the other under the leadership of Thomas and Alexander Campbell. Both of these movements put priority on Christian unity believing that denominationalism was a product of division and dissent on aspects of Christian faith that are not essential our core. They both rejected creeds and confessions believing that there should be no tests of faith, that the Bible was enough. Both movements believed in a return to the Bible and a restoration of the church of the New Testament, of getting the church back to its roots, back to basics. Today, I invite us to follow in the footsteps of our Disciples founders and look back to the basics, to look back to the Bible and the church of the New Testament to glean insight about the core essentials of our faith practice. And our scripture this week from Acts 2:42-47 is a great place to look at the early church as it was getting started to discern what some of those core practices are about. This passage is perhaps one of the clearest places where we see the core changeless practices of those who were starting the early New Testament church. Simply put those practices are education, fellowship, potlucks and prayer. All things the church does today. Nice to know that in close to 2000 years not much has changed. And we can and should feel comfortable and grounded in this. The way we carry out each of these core practices has certainly changed over time. But the fact that we do them has not changed since the church started. I’d like to look deeper at these practice though, to try and discover a bit more about their essence. Acts simply tells us that the fledgling community of Christians began to practice these 4 things. We might call them 4 Marks of Faithful Community. Notice that it does not simply say studying, reading, or interpreting. No, it says teaching – a practice that requires at the least a teacher and a student. And act that implies interaction between people. Again, notice the emphasis on interaction and relationship. Not living alone, as individuals. But living together, sharing life with one another. Notice also the extent to which they shared life – the sold what they had and gave the proceeds to those in need. What an incredible ethic. They created an economy based upon NEED, not capital, not individualism, not ability to succeed, not inheritance, not communism, not socialism. And economy based on a faith community and the NEEDs of people. This is about both daily meals and communion – because really the two are not separate. And yet again, notice the value placed on not just eating, but eating together. Common meals….potluck meals, sharing food with one another. Now here it is not as clear if we are talking about individuals praying or groups praying. But consider what prayer essentially it: conversation with God. So already it implies a relationship and interaction between the one who prays and the God to whom that person prays. And unless your prayers are quite selfish, prayer involves requests for or on behalf of other people, considering the situations of those people and asking for help. And it may not just be other people….it could be places, situations, local happenings or world events. 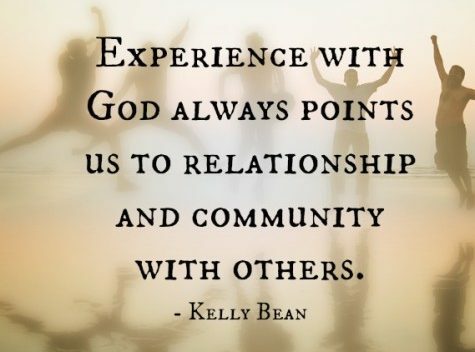 The point: prayer involves spending time in relationship with God focused on both yourself and those people, places and situations beyond your self. In other words, prayer, like the other 3 marks in Acts, is about interaction and relationship, about moving beyond your self to give time an attention to those around you. Education, fellowship, potlucks and prayer – the foundations of the early church. Changeless acts of our faith tradition that have been passed down since the very beginning of Christian community. Practices which give us an identity, which ground us and orient us towards God and the way God would have us live in this world. And at their essence, these practices are about interaction and relationship with others. You see, if these essential practices teach us anything, it’s that we cannot separate our relationship with God from our relationship with others. These practices are designed to create a community so full of God’s love that it is naturally overflowing. They are not just about taking care of “me and my own” or “us and our own”. They are about care that extends to the other. Most every church engages in these practices in some way, shape or form. They are part of our tradition, our identity. But amidst the daily grind of ministry, the trials and triumphs of life, amidst managing and operating church programs and buildings, calling and visiting members of a faith community, engaging in missions work on local, national and global levels, I wonder if the church gets distracted…? I wonder if amidst all the different ways that Christians work so hard to be the church…we package our faith in meaningful messages and trendy publications, in beautiful buildings, in worship services that we call traditional or contemporary…amidst all this, do we get distracted from our core? Do we get distracted so that when worship or a building or a publication changes, we are more focused on the change in packaging than the changelessness or our core practice? And this makes me wonder whether the church has become more devoted to its packaging than to the core practices of faith? Are we devoted to these core practices – teaching, sharing life together, sharing food, prayer? Are we so devoted to these core practices that other people in our community are in awe of how we love one another through these practices – regardless of how we package them? Do other people know us because of how we share our daily lives with one another? Do they see the beauty in how we pray with and for other people? Are they jealous of our potluck meals? Are they confounded by the extent to which our teachings compels us to reach out in love and grace? Are they amazed at how we care for others during tough times? Are they inspired by honesty, authenticity, and vulnerability of our conversation with God and with one another? Do they see the communion that is present whenever we gather to eat? Though they may see us as hypocrites when we fail to practice the love that we preach, are they astonished when they see that through our teachings we are earnestly working to overcome our hypocrisy? If the answers to these questions are to be the YES that we want them to be, then we must renew our focus on the essential changeless practices of our faith. The way we do them must communicate to others the essence of these essentials. And that means the way we do them might need to change from the way we once did them. Not the the way we once did them is bad, but just that it no longer communicates clearly to people who are living today’s world. The changeless practices remains, but the way we carry out the practice may need to change. Who is included and who is excluded from our potluck, our prayers our life together? Who are we praying for? And who do we neglect? Who are we inviting over to dinner? And who do we overlook? Who are we opening this community to? And who have we not yet made an opening for? Is our teaching compelling us to live differently, to love unconditionally, to freely give of ourselves? Or is our teaching to bland to call us to do much of anything? How we answer these questions and what we do about those answers has everything to do with resurrection. You see, in the aftermath of Jesus death, the Christians left behind clung to these 4 marks as the foundation of their faith community: education, fellowship, potlucks and prayers. The story of the church is filled with persons who have called the church back to these basics, who have given their lives to resurrect these core changeless aspects of our faith within the church. Today, we are part of that same story….seeking resurrection in this place for this time among the people within this community. How we are able to resurrect these practices in this church will be determined by how much strength we find in the changeless-ness of their essence and how we change the way we practice them so that we communicate them clearly, effectively and faithfully for this day and all the days ahead.